ED Flow Optimization In Minutes | Potentia Analytics Inc.
Instantly Optimize Patient Flow…Optimize Staffing To Demand. Why are these such hot topics in today’s healthcare setting? Because the flow of patients through an emergency department has a significant impact on a wide range of areas that demand operational efficiency to achieve an improvement in patient & provider satisfaction, reduction of patients who leave without being seen by a provider due to high wait times, loss in revenue and much more. Until recently, effectively changing flow could absolutely be done but not without a lengthy evaluation process, often involving experts or consultants, from months to years and great deal of human effort in the form of spreadsheets, lengthy studies regarding flow theory for station/resource utilization, patient wait times, external factors and then more evaluation if those efforts proved to be inefficient. The ER Patient Flow Solution, Bernoulli, accomplishes within minutes, what most have only been able to accomplish with a great deal of human effort to uncover what works. Bernoulli allows for leadership to view the full impact of their flow theory on a regular basis. 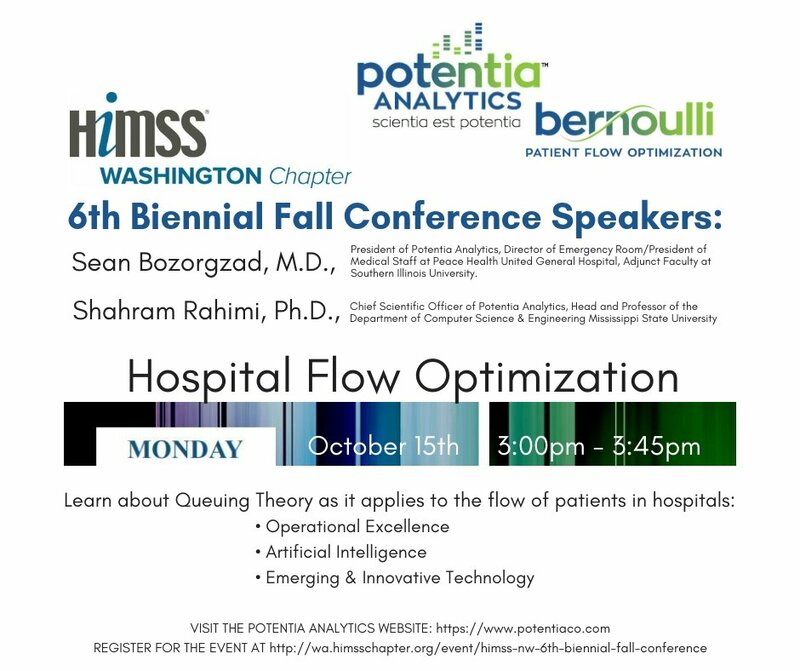 The advanced algorithm within Bernoulli, optimizes staffing based on historical data and provides forward looking simulation to warn of upcoming bottlenecks. It allows you to play “What If” scenarios to instantly view the results of your changes to flow before making decisions that will impact your department. Bernoulli’s powerful and flexible architecture can flow model simple single provider or sophisticated multi-track ERs including all resources and stations. For example, PROBLEM: you don’t know it yet but you are going to have a back-up in the lab in 2 hours. Solution: Bernoulli gives knowledge that there will be a lab back up in 2 hours. Instead of reacting after the bottleneck happens, it allows teams to get in front of the problem with a solution in real-time, example: drawing blood in the ER rather than sending patients to the lab during that back-up period increasing wait-times. Process improvements can be easily prototyped to explore new ideas without lengthy and costly trials. Fully customized reporting solutions gives transparency to operational efficiencies immediately showing when and where changes will the make impact. On the back end, by using an Intelligent Staffing Solution with Open Shift Management, like Symphony, in conjunction with Bernoulli further optimization will be accomplished. Streamlining the operation behind current staffing models creates more time for schedulers to work towards important concerns like improving the provider relationship in a more organic way rather than building relationships based on bartering to cover unwanted shifts. If your providers self-schedule, it removes a significant amount of time they will spend at the computer with this operational function.